Charlie Stross on why he mainly no longer reads science fiction books. The exercise of substituting “SF” for “Design” or “Speculative Design” is left to the reader. Similar to the sad baggage surrounding space battles and asteroid belts, we carry real world baggage with us into SF. It happens whenever we fail to question our assumptions. Next time you read a a work of SF ask yourself whether the protagonists have a healthy work/life balance. No, really: what is this thing called a job, and what is it doing in my post-scarcity interplanetary future? Why is this side-effect of carbon energy economics clogging up my post-climate-change world? Where does the concept of a paid occupation whereby individuals auction some portion of their lifespan to third parties as labour in return for money come from historically? What is the social structure of a posthuman lifespan? What are the medical and demographic constraints upon what we do at different ages if our average life expectancy is 200? Why is gender? Where is the world of childhood? Some of these things may feel like constants, but they’re really not. Humans are social organisms, our technologies are part of our cultures, and the way we live is largely determined by this stuff. Alienated labour as we know it today, distinct from identity, didn’t exist in its current form before the industrial revolution. Look back two centuries, to before the germ theory of disease brought vaccination and medical hygeine: about 50% of children died before reaching maturity and up to 10% of pregnancies ended in maternal death—childbearing killed a significant minority of women and consumed huge amounts of labour, just to maintain a stable population, at gigantic and unpleasant (to them) social cost. Energy economics depended on static power sources (windmills and water wheels: sails on boats), or on muscle power. To an English writer of the 18th century, these must have looked like inevitable constraints on the shape of any conceivable future—but they weren’t. Similarly, if I was to choose a candidate for the great clomping foot of nerdism afflicting fiction today, I’d pick late-period capitalism, the piss-polluted sea we fish are doomed to swim in. It seems inevitable but it’s a relatively recent development in historic terms, it’s clearly not sustainable in the long term. However, trying to visualize a world without it is surprisingly difficult. Take a random grab-bag of concepts and try to imagine the following without capitalism: “advertising”, “trophy wife”, “health insurance”, “jaywalking”, “passport”, “police”, “teen-ager”, “television”. SF should—in my view—be draining the ocean and trying to see at a glance which of the gasping, flopping creatures on the sea bed might be lungfish. But too much SF shrugs at the state of our sea water and settles for draining the local aquarium (or even just the bathtub) instead, or settles for gazing into the depths of a brightly coloured computer-generated fishtank screensaver. If you’re writing a story that posits giant all-embracing interstellar space corporations, or a space mafia, or space battleships, never mind universalizing contemporary norms of gender, race, and power hierarchies, let alone fashions in clothing as social class signifiers, or religions … then you need to think long and hard about whether you’ve mistaken your fishtank for the ocean. And I’m sick and tired of watching the goldfish. Azeem’s excellent Exponential View newsletter this week published some predictions for 2018, which you should go take a look at. 1) Hard Brexit happens to the UK by default, rather than planning. 2) UK becomes virtual client state of EU anyway, any business wanting to make money in goods or services (apart from hardliners like Witheredspoons and Dyson) has to ditch ideology and comply with EU regs, without any of the benefits to citizenry. Well done everyone. 3) USA becomes increasingly insular, either as result of second Trump term or more likely to concentrate on recovering from the first… GAFA gets bashed a lot over next 5yrs and plateaus, net-non-neutrality locks in incumbent value chains but favours big carriers/media not big tech. 5) European (esp French, German) startups focus on EU and Africa, to an extent Asia Minor and South Asia as markets. Edge-computing hybrids leapfrog solely cloud-centric business models in hipness if not value (yet). 6) one of the Gulf states cashes out on oil, goes all-in on becoming a silicon manufacturer/designer/licenser, with focus on neural architectures, Indian and Chinese manufacturers license, buy or copy. 6.1) Tim Cook moves Apple corp HQ to Dubai. Significant automation in Apple supply chain + IP risks allow edge manufacturing of most of their premium hardware. Other members of GAFA pay attention as the fruit company leaves the plateau of the last few years behind. 7) Chinese firm announces it has an AGI running on a supercomputer running on UAE-designed chips. 9) It’s 2027 and 60% of tech ‘unicorns’ are HQ’d in EU, UAE, India or Singapore. Believing the strangest things, loving the alien. The variety of potential minds in the universe is vast. Recently we’ve begun to explore the species of animal minds on earth, and as we do we have discovered, with increasing respect, that we have met many other kinds of intelligences already. Whales and dolphins keep surprising us with their intricate and weirdly different intelligence. Precisely how a mind can be different or superior to our minds is very difficult to imagine. One way that would help us to imagine what greater yet different intelligences would be like is to begin to create a taxonomy of the variety of minds. This matrix of minds would include animal minds, and machine minds, and possible minds, particularly transhuman minds, like the ones that science fiction writers have come up with. Today, many scientific discoveries require hundreds of human minds to solve, but in the near future there may be classes of problems so deep that they require hundreds of different species of minds to solve. This will take us to a cultural edge because it won’t be easy to accept the answers from an alien intelligence. We already see that reluctance in our difficulty in approving mathematical proofs done by computer. Some mathematical proofs have become so complex only computers are able to rigorously check every step, but these proofs are not accepted as “proof” by all mathematicians. The proofs are not understandable by humans alone so it is necessary to trust a cascade of algorithms, and this demands new skills in knowing when to trust these creations. Dealing with alien intelligences will require similar skills, and a further broadening of ourselves. An embedded AI will change how we do science. Really intelligent instruments will speed and alter our measurements; really huge sets of constant real-time data will speed and alter our model making; really smart documents will speed and alter our acceptance of when we “know” something. The scientific method is a way of knowing, but it has been based on how humans know. Once we add a new kind of intelligence into this method, science will have to know, and progress, according to the criteria of new minds. At that point everything changes. An AI will think about science like an alien, vastly different than any human scientist, thereby provoking us humans to think about science differently. Or to think about manufacturing materials differently. Or clothes. Or financial derivatives. Or any branch of science or art. The alienness of artificial intelligence will become more valuable to us than its speed or power. As we invent more species of AI, we will be forced to surrender more of what is supposedly unique about humans. Each step of surrender—we are not the only mind that can play chess, fly a plane, make music, or invent a mathematical law—will be painful and sad. We’ll spend the next three decades—indeed, perhaps the next century—in a permanent identity crisis, continually asking ourselves what humans are good for. The greatest benefit of the arrival of artificial intelligence is that AIs will help define humanity. We need AIs to tell us who we are. “Generally speaking, until recently machines were predictable and more or less easily understood. That’s central to the definition of a machine, you might say. You build them to do X, Y, & Z and that’s what they do. A car built to do 0-60 in 4.2 seconds isn’t suddenly going to do it in 3.6 seconds under the same conditions. A few months back I somewhat randomly (and somewhat at the behest of a friend) applied to run a program at MIT Media Lab. It takes as inspiration the “Centaur” phenomenon from the world of competitive computer chess – and extends the pattern to creativity and design. I’m personally much more interested in machine intelligence as human augmentation rather than the oft-hyped AI assistant as a separate embodiment. “…there’s a difference between doing stuff for me (while I lounge in my Axiom pod), and giving me superpowers to do more stuff for myself, an online Power Loader equivalent. I was rejected, but I thought it might be interesting to repost my ‘personal statement’ here as a curiosity, as it’s a decent reflection of some of my recent preoccupations about the relationship of design and machine intelligence. I’d also hope that some people, somewhere are actively thinking about this. Let me know if you are! I should be clear that it’s not at the centre of my work within Google Research & Machine Intelligence but certainly part of the conversation from my point of view, and has a clear relationship to what we’re investigating within our Art & Machine Intelligence program. We are moving into a period where design will become more ‘non-deterministic’ and non-human. Products, environments, services and media will be shaped by machine intelligences – throughout the design and manufacturing process – and, increasingly, they will adapt and improve ‘at runtime’, in the world. Designers working with machine intelligences both as part of their toolkit (team?) and material will have to learn to be shepherds and gardeners as much as they are now delineators/specifiers/sculptors/builders. I wish to create a research group that investigates how human designers will create in a near-future of burgeoning machine intelligence. How might we make the processes and outcomes of machine intelligences more obvious to a general populace through design? How might we build and popularize a critical language for the design of machine intelligence systems? How might we create teams of human and non-human intelligences in the service of better designed systems, products, environments? What new outcomes and impacts might ‘centaur designers’ be able to create? How might design (and particularly non-intuitive expertise) be democratised through the application of machine intelligence to design problem solving? How might the design of physical products both benefit from and incorporate machine intelligence, and what benefits would come of this? How might the design of physical environments both benefit from and incorporate machine intelligence, and what benefits would come of this? The session I staged at FooCamp this year was deliberately meant to be a fun, none-too-taxing diversion at the end of two brain-baking days. It was based on (not only a quote from BSG) but something that Matt Biddulph had said to me a while back – possibly when we were doing some work together at BERG, but it might have been as far-back as our Dopplr days. He said (something like) that a lot of the machine learning techniques he was deploying on a project were based on 1970s Computer Science theory, but now the horsepower required to run them was cheap and accessible in the form of cloud computing service. This stuck with me, so for the Foo session I hoped I could aggregate a list people’s favourite theory work from the 20thC which now might be possible to turn into practice. It didn’t quite turn out that way, as Tom Coates pointed out in the session – about halfway through, it morphed into a list of the “prior art” in both fiction and academic theory that you could identify as pre-cursors to current technological preoccupation or practice. 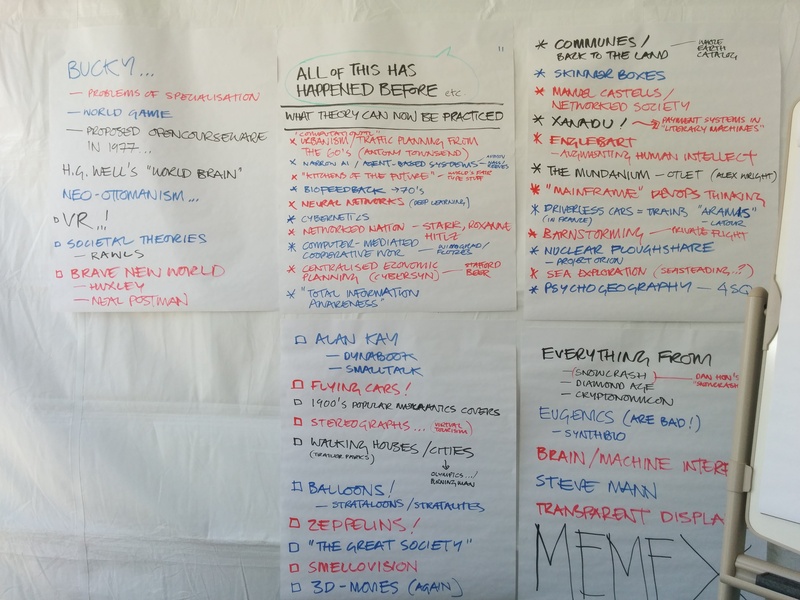 Nether the less it was a very fun way to spend an sunny sunday hour in a tent with a flip chart and some very smart folks. Thanks very much as always to O’Reilly for inviting me. 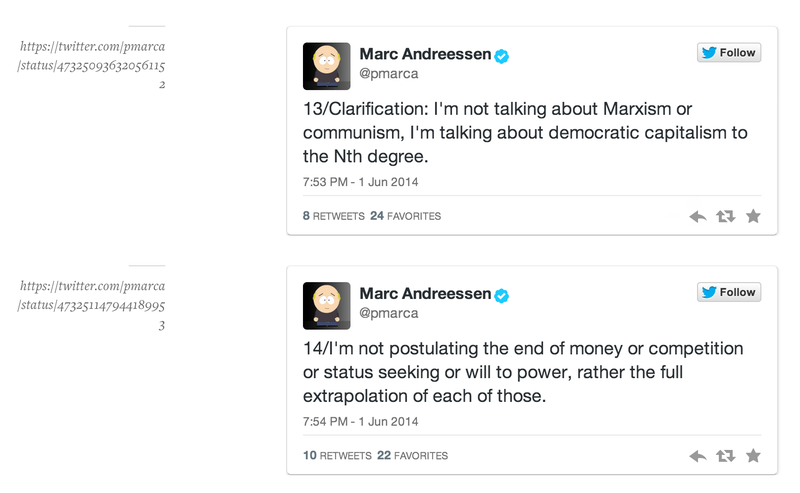 Steven Johnson drew my attention to this stream of twitter (all these years later ‘tweets’ still makes me cringe) from Marc Andreesen. Andreesen is now famous as a venture capitalist, cheerleader of The Californian Ideology, and perhaps most of all for the quote/essay ‘Software is eating the world’. 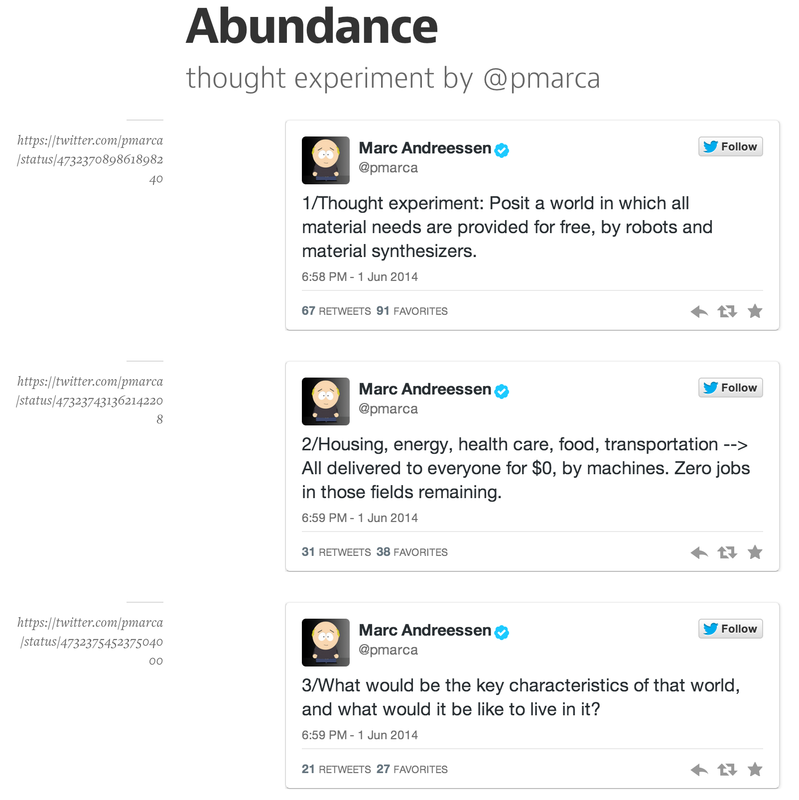 I have a lot to be thankful to Marc Andreesen for – he, in part, invented the software that effectively gave me (and you, probably) a financially-viable life messing about with what I love – networked technology. So – assuming you can’t be bothered to click the link – what does he say? Reminds me of “Maximum Happy Imagination” from Robin Sloan’s excellent “Mr Penumbra’s 24hr Bookstore”. After a lot of stuff that anyone with mild extropian/protopian/Rodenberrian exposure might nod along to, Andreesen’s stream of consciousness ends like this. His analogies run out in the 20th century when it comes to the political, social and economic implications of his maximum happy imagination. That system of the world was invented. It’s not really natural. To imagine that capitalism is not subject to deconstruction, reinvention or critique in maximum happy imagination seems a little silly. If disruption is your mantra – why not go all the way? He states right at the start that there are zero jobs in the sectors affected by his future. Writers on futures such as Toffler and Rifkin, and SF from the lofty peaks of Arthur C. Clarke to the perhaps lower, more lurid weekly plains of 2000AD have speculated for decades on ‘The Leisure Problem’. Another world is possible, right? I’ll hope Marc might grudgingly nod at that at least. It’ll need brains like his to get there.